Does the look of your legs have you less than excited to put on a pair of shorts or hit the beach in a swimsuit? If so, you’re not alone. Over time, changes in weight, pregnancies, medical conditions and plain, old genetics can make our legs look less like ours and more like our parents! One of the most common leg complaints are varicose and spider veins. While these two are related, they aren’t exactly the same, and the treatments to get rid of them are very different too. Varicose veins are larger, deeper leg veins that are swollen and dilated so that they stick out and appear raised on the skin’s surface. 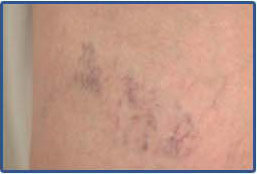 They are blueish in color, but they aren’t just a cosmetic eyesore—varicose veins can truly be painful! They can ache or make your legs feel numb or tingling. These symptoms are often worse after a long day on your feet or with physical activity, making it hard to be as active or physically fit as you used to be. Now, on to spider veins. These are smaller dilated blood vessels that are much closer to the skin’s surface. In our legs, spider veins are a typical result of deeper varicose veins. If you think of the veins in your legs as rivers and creeks, the varicose veins are the rivers that feed the smaller creeks which are the spider veins. So, it’s very likely that if you’ve got one, you’ve got the other too. But spider veins are different from varicose veins in that they generally don’t hurt. They can either be red, blueish or purple and will often look like fine tangles of blood vessels clustered close together on the skin’s surface. It’s important for you to understand that the two of these are related because if you treat the finer, surface spider veins without doing anything about the larger varicose veins that feed them, then your treatment isn’t really going to work that well and they will very likely just reappear. These two options are the most common ones you will find out there to treat both problems. Though the overall goal of both is to get rid of ugly, dilated blood vessels, they do this in different ways. Each treatment is perfectly suited to work given the size of the blood vessel that its targeting. The key to success if finding an experienced practitioner that understands this and knows how to use each! For those larger, deeper varicose veins, sclerotherapy is the treatment of choice. As the name implies, this treatment involves injecting a special, medicated solution into the vein that causes it to harden or sclerose. Once this happens, it’s permanent and the properly treated vein will essentially become useless and over time, be broken down and reabsorbed by the body. Sclerotherapy takes a very skillful hand. Even though we say it’s a great treatment for medium to large varicose veins, keep in mind that your injector must gauge the depth and width of these vessels (which can be millimeters) to successfully get that solution into each vessel with a very fine needle. Once in the right place, the right amount of solution needs to be injected to fill the vessel to get it to harden and go away. It can be a tricky process and at times, a very tedious one! Make sure your injector is comfortable and experienced with sclerotherapy in order to get the very most out of your treatment. Most sclerotherapy sessions can take anywhere from a few minutes up to an hour, depending on how many varicose veins you have that need treatment. It does involve the use of a tiny needle, and most people who’ve had it will tell you that it can hurt a bit! You will also need to wear special “pantyhose” called compression stockings for 3 to 10 days afterwards. These help compress the veins and keep the sclerosing solution in the right place so that you can get rid of the vessels more effectively. Most people who have sclerotherapy for varicose veins will see results after their first treatment! However, many people require multiple treatments every 1 to 2 months to completely get rid of their unwanted varicose veins. And even despite treatment, some veins can be resistant to sclerotherapy. One other important thing to mention here is that sometimes after sclerotherapy, you can get an area of brownish discoloration called hemosiderin staining in the skin around the treated vessel. This happens because of the deterioration of the red blood cells that are inside of the treated vessel. While it’s not a permanent discoloration, it can take a very long time for it to resolve on its own. The good news is that there are lasers that can be used to treat it and help it go away faster! Up until a few years ago, sclerotherapy was really the only option to treat both varicose and spider veins. And it was really not a great option for the latter, as you can imagine the necessary precision and difficulty to get the needle directly into a vein that is barely larger than it is! Enter vascular lasers! Lasers totally eliminate the “hit or miss” approach of sclerotherapy for small, fine spider veins. They allow for targeted and effective treatment of multiple, fine spider veins. The light energy of the lasers specifically targets the heme molecule in red blood cells. This means that the heat energy harmlessly passes through the skin, until it hits a blood vessel and then it’s sucked up into the vessel, causing the blood inside of it to coagulate, effectively closing it off and causing it to become ineffective. Lasers are ideal for spider veins that are as small as 1/8th of an inch wide, and they may be effective at treating medium sized vessels of up to 3 millimeters as well. While lasers can feel a bit like a rubber-band snap against the skin, many of our patients who’ve had both laser and sclerotherapy say that lasers are the less painful of the two. Again, just like with sclerotherapy, a treatment session can range in time depending on how many spider veins that are treated. Multiple treatment sessions are usually the norm to get rid of all those unsightly blue, red and purple spider veins. These treatment sessions are usually scheduled about 6 weeks apart to give your body the time it needs to heal and see the full effects of the laser. 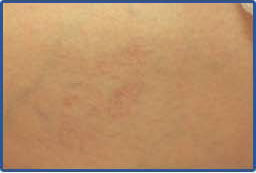 Unlike sclerotherapy, there isn’t a risk of hemosiderin staining of the skin. In fact, like we mentioned briefly before, lasers are a way that we can it, helping it go away more quickly! Unfortunately, it is a different laser than the one that we use for the treatment of spider veins. Many patients ask us about treatments for spider veins on the face. Also called telangiectasia, these fine blood vessels don’t exactly form on the facial skin for the same reasons they do on the skin of the legs. These can become more noticeable with trauma, sun exposure, inflammation (like rosacea) and often, are just a normal part of the aging face. However, the same laser that we use for spider veins on the legs can be used for unwanted blood vessels on the face. Because the underlying structure of the two is the same, the laser works the same way and is a quick, easy and effective treatment for these unwanted facial blood vessels. With such a targeted and efficient treatment, sclerotherapy is rarely used to treat this problem in this day and age. Most people with unwanted facial telangiectasia will need 1 to 3 treatment sessions with the laser to completely clear them away. The results are usually immediate and makeup and normal skincare can be resumed immediately after treatment making it fit easily into you hectic, busy schedule. That’s right, there’s no downtime at all! Give us a call today if you’re interested in learning more about our varicose and spider vein treatment program. Come see why our comprehensive approach and highly trained providers are the right choice for you!